Nobody does irony like the British. Most other people don’t appreciate the sentiments involved, the ability to say things without offering more than a glance at the detail. The best British humour tends not to travel well, it loses too much in translation or in transit. It follows therefore that the great Ian Anderson of Jethro Tull may have been misunderstood by many when he sang, ‘everybody is from somewhere, even if they’ve never been there.’ Not an attempt at humour of course, but a very wise insight into the fact that some people have to spread their wings to find a place where they feel truly at home. I took no offence at being planted in England, indeed quite liked it - and still do - for many years. Nor did I fret endlessly about mislocation or having somehow ended up with the wrong passport. I’ve never seen it that way, I’ve broadened my horizons but don’t quibble about my nationality. Some things were meant to be, and I was meant to be born British. Yet it doesn’t mean that every cell in my body is painted a tasteful design of red, white and blue. Without being unfaithful to my motherland, I have discovered a great number of other special places some of which have been my home, others just places on my journey. And still sitting at the top of a list some several hundred places long, is a small Italian town called Fano. Fano, as I am sure it would admit, isn’t quite Venice, Rimini or Rome, but shines just as brightly. When they couldn’t find architects to design it they enlisted Angels instead, and the same bright soul shines down every street today. A 60,000 population lives happily together in a former Roman settlement with traditional Italian palazzi and modern apartment buildings. It is on the Adriatic coast, a market town with a modest tourist industry and the usual attractions. 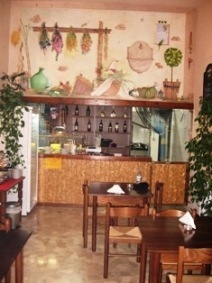 Its restaurants are typically Italian, its shops a blend of traditional and modern and its streets peaceful and clean. Facilities are good, Fano caters for most tastes be they for sport or artistic pursuits. There are several cinemas showing more than the latest American bilge, and theatres, one of which is enormously impressive and reminiscent of Renaissance architecture. The old town is well preserved, barring a few lapses, and blends nicely with the more modern developments outside the old city walls. The people are friendly for the most part, very helpful and welcoming, certainly always have been to me. It was part of what made it all so special. It was the place where I feel I discovered Italy (no small matter) having originally landed just down the coast in Ancona and stayed there for a few days. Ancona’s OK but not what I’d expected. Fano was, in kind. Not only was it so pretty, I also went there on Sunday afternoon and before I left experienced probably one of the most beautiful yet simple things of my whole life... the passeggiata. There’s nothing theoretically impressive about the passeggiata, it’s just people going for a walk. But they all do it at the same time, in the same place, in the same unhurried way. The whole town seems to come into the centre for a few hours, without any real purpose, the same way families have been doing for centuries, just to see their friends and make new ones. It is an amazingly emotional experience. Where I grew up people hardly knew their neighbours, it was so enlightening to see such warmth and community. Tucked around a corner is a wonderful little restaurant serving naught but macrobiotic fodder, sadly run for the most part by macrobiotic devotees who have taken the diet a little too seriously and ended up rather lean and gaunt as a result, but customers are not obliged to share the high and mighty approach to nibbling and when in Fano I do as the tree huggers do – with a little more zeal – and enjoy a bowl of miso and leek soup before tucking into a mixture of pasta, rice and some fantastic steamed vegetables. I left almost as hungry as I went in, macro eating encourages you to chew, and not to fill your stomach more than 70%. Well, that’s me out! Quality, yes! Quantity? Well, Il Punto Macrobiotico generally doubled up as a starter. I’d be straight down via Nolfi afterwards for a piadina. The piadina is almost like a pizza, but generally folded over rather than eaten flat. It usually contains lard but a few places have experimented with other oils and the most successful is that seen here in the picture, the nicest food there is, apart from Egyptian koshary and any trip to Fano involves by definition a few piadine. For the brief spell I spent working in Fano I’d have piadina every day. If it so happened that I had to knock teaching on the head and settle down in exchange for being able to choose where I lived, I could only give one answer. I might try to say Kazakhstan, but essere onesto, I simply couldn’t resist the cobbled streets and birdsong, the secluded bars and magical Sunday evening stroll.